A humble hero went home. On June 15, 2015, Elisabeth Elliot went home to be with the Lord. Inspiring tributes to this humble hero abound. The impact of her life—lived faithfully for Christ—reaches across borders and generations. When she returned to Ecuador to minister to and live among the people who had brutally murdered her husband and four other men, she courageously demonstrated what it means to “love your enemies and pray for those who persecute you” (Matt. 5:44). UPDATE: Walking with the Waodani is HERE! Her passing coincides with the upcoming release of our newest resource: Walking with the Waodani, a geographical unit study that features homeschool graduate Russell Winter's 7-week-long adventure in Ecuador. Russell had the great privilege of joining a Wao Tour that took him to the very jungle where Elisabeth Elliot's husband was killed. Russell's experience was made possible by I-TEC (Indigenous People’s Technology and Education Center), a missions organization founded by Steve Saint, son of Nate Saint, the “Jungle Pilot” who was one of the five young men killed in 1956 by the Waodani Indians (known as Aucas) whom they were trying to reach with the gospel. Steve currently leads the ministry with the vision of finding better ways of doing missions and giving indigenous God-followers the tools they need to fulfill their role in the Great Commission. 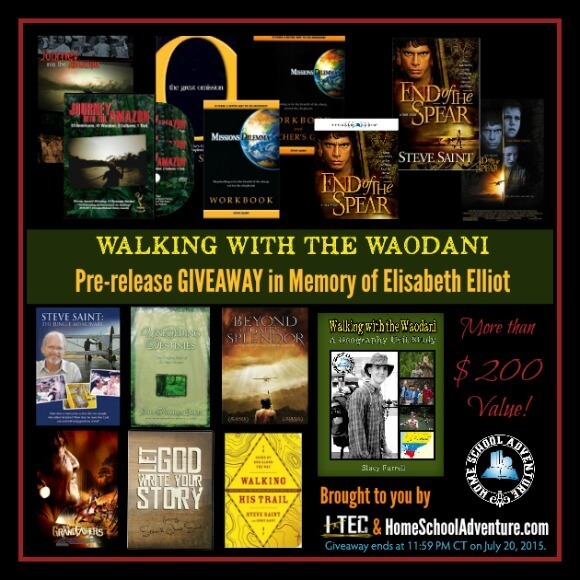 You will be hearing more from us about I-TEC and Russell's adventure in the coming weeks, but right now we want to introduce you to an exciting giveaway we are hosting in memory of Elisabeth Elliot's homecoming. In partnership with I-TEC, we have assembled a powerful collection of resources (valued at more than $200) to inspire all Christ-followers—students and parents alike—to live more fully focused on our ultimate purpose and destination. Congratulations to Niki from North Carolina for winning the Walking with the Waodani Pre-Release Giveaway! This would be incredible to win! Elisabeth Elliot was an inspiration to me and so many others. I would have loved to meet her, here on this earth.